Lemon Harangue Pie: "Irrefutable evidence" of Siberian yeti? I love a good Bigfoot story. Naturally, you can imagine my excitement when I read that researchers had found "irrefutable evidence" of the existence of the Abominable Snowman. A group of international scientists set out on an expedition to the Kemerovo region of Siberia. 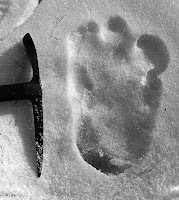 There, they found footprints, a supposed bed, and various markers used by the yeti to mark its territory. All the evidence collected will be analyzed in a special laboratory. OK, so this really isn't anything we haven't heard before. As usual, time will tell.